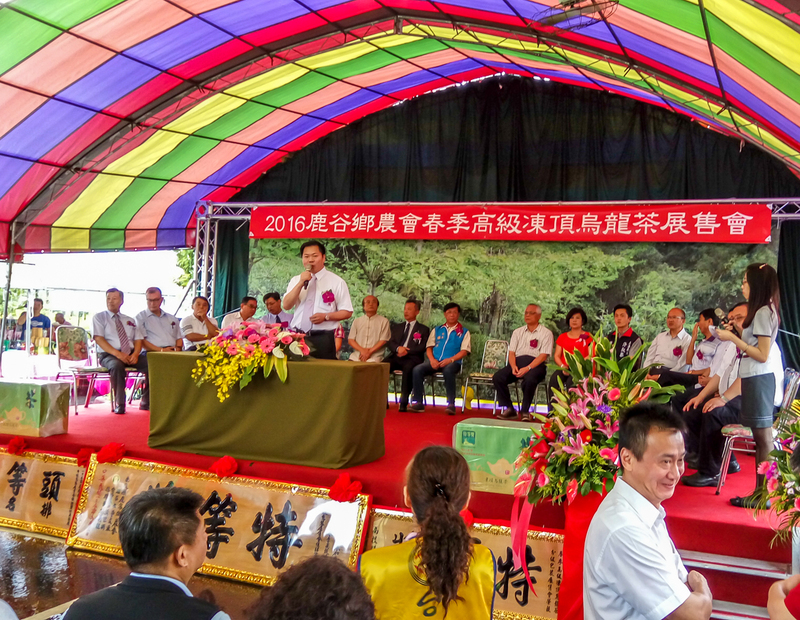 Last weekend was the big party at Lugu's Farmer Association. The winners of the world's biggest tea competition came to receive their prizes. Let me give you a quick update of this year's event. First, let's note that 6441 lots were presented to the competition. This competition happens in 2 steps. 1. The first tasting is made by judges from the farmer's association. They are mostly farmers and/or tea sellers. This year, they rejected 42% of the lots. 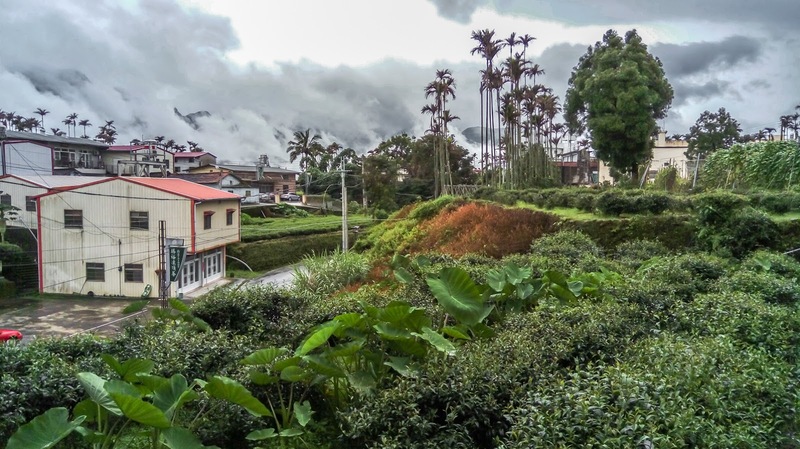 The remaining lots were graded as 2 plum flowers (23% of the lots) or 3 plum flowers (19%) or were sent for further tasting to Taiwan's public Tea Reasearch Station (16%). - a third ('bronze medal') category with 524 lots (8%). This competition takes place for both the spring and winter harvests. 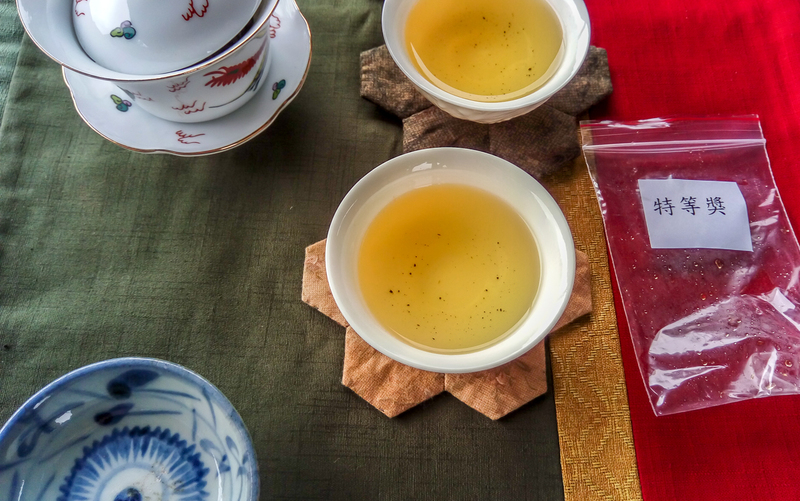 The prized teas are packaged, sealed and their rank is clearly marked. Each lot weighs 20 jins (12 kg) and is then packaged into 40 packs of 2 x 150 gr (for the stage 2 teas) or 20 packs of 2 x 300 gr (for the stage 1 teas). 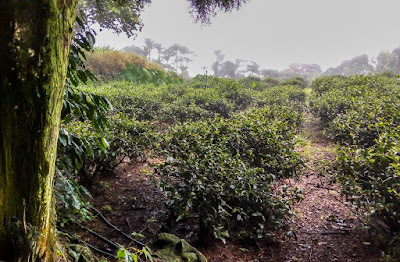 The farmers receive these boxes and 1 bag of the tea sample that remains after the various tastings. (That's why the farmers have to submit approximately 21 jins, but only get 20 jins back for sale. 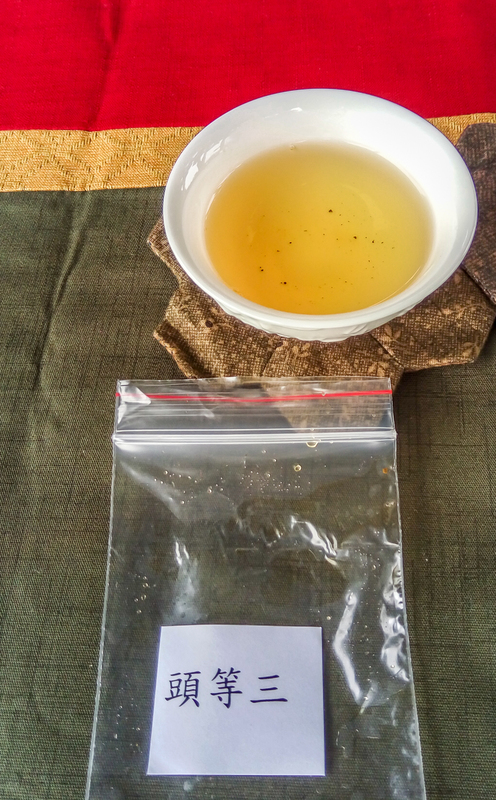 This extra tea that is returned to the farmer is what makes it possible to taste the tea before purchasing the sealed package. Many farmers provide this kind of tasting during this event. 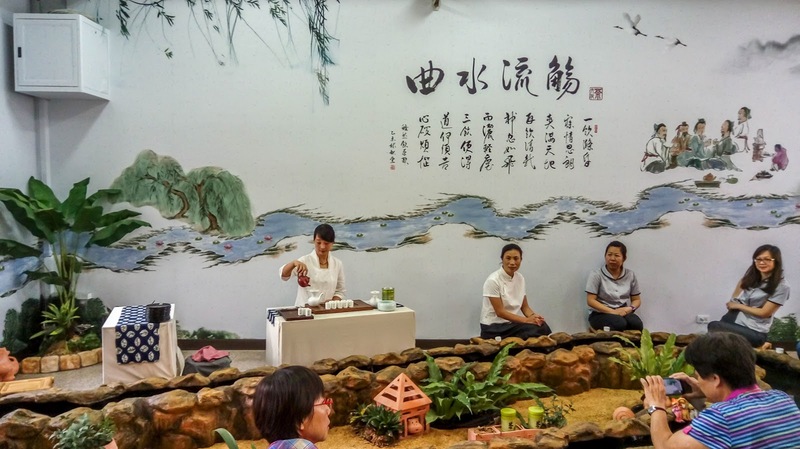 It's one of the big attraction: you get to taste so many different teas from so many different farmers in just one place. The winner in my hand! You learn a lot from this event. 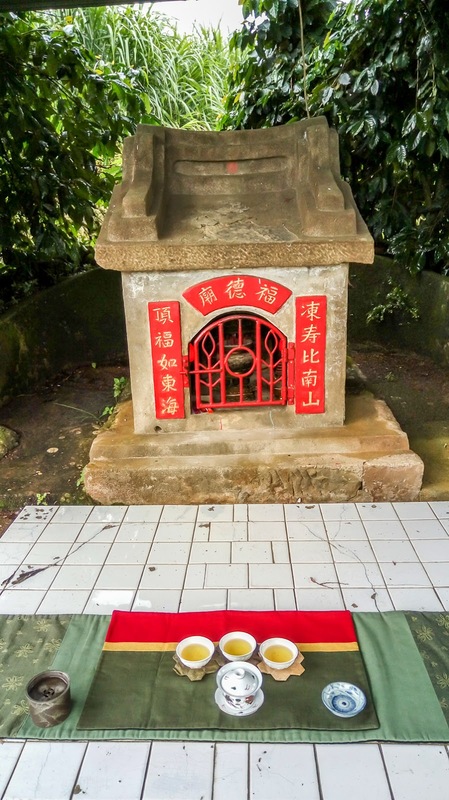 One of the most surprising fact you'll learn (and that I reported in 2007) is that the Dong Ding competition winners don't come from Dong Ding at all, but come from higher altitudes. 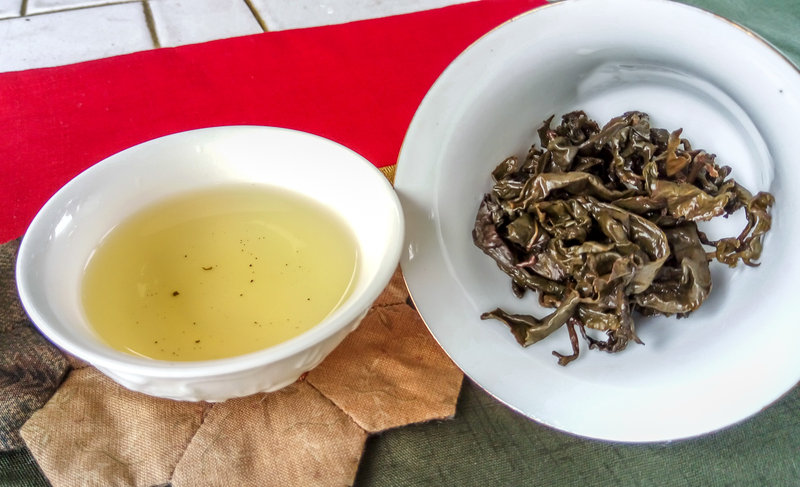 They still qualify for the competition, because Dong Ding Oolong refers more to the process (with roasting, aka Hung Shui) than to the location. 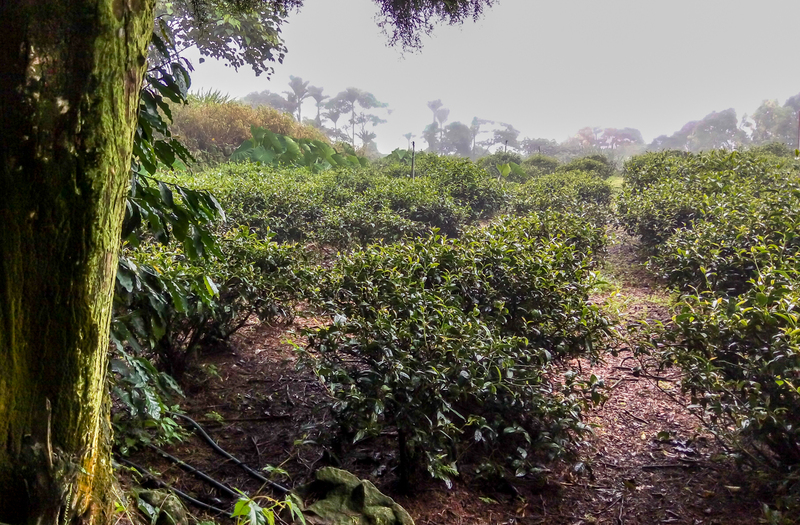 You'd expect the teas from the same category to taste similarly, but you find out that there are differences in oxidation and roasting level within the same category. Also, the origin of leaves impacts the taste. 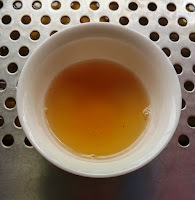 If they come from Alishan, Shanlinxi or TsuiFeng, this will impact the aromas. To get a clear picture of what is quality, you need to learn from standards. 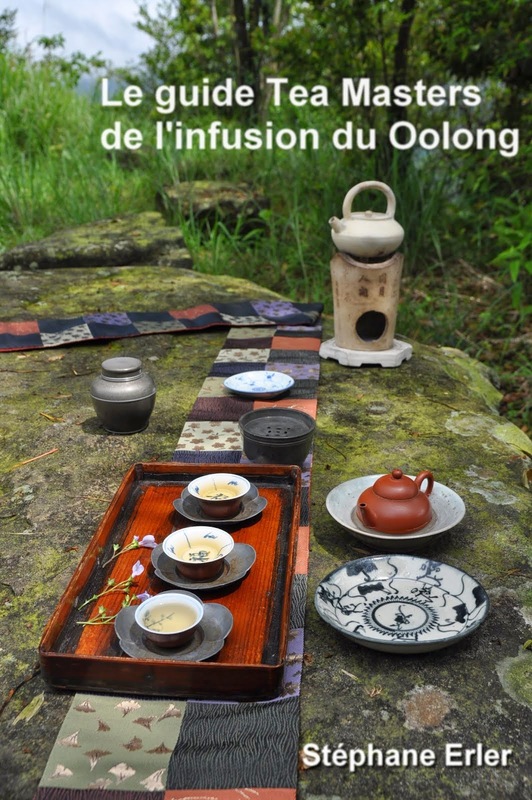 So, the main reason for my trip to this event is that every buyer of 2 jins or more of competition Oolong has the opportunity to taste the winner and the 10 runner ups. But I was so lucky that day, that one of the very first table where I stopped by had 1 jin of the winning tea! The rest (38 boxes) had already sold out for 5000 USD per box of 2 x 150 gr! I didn't purchase it, but was very happy to hold this box! The winner in my cup! 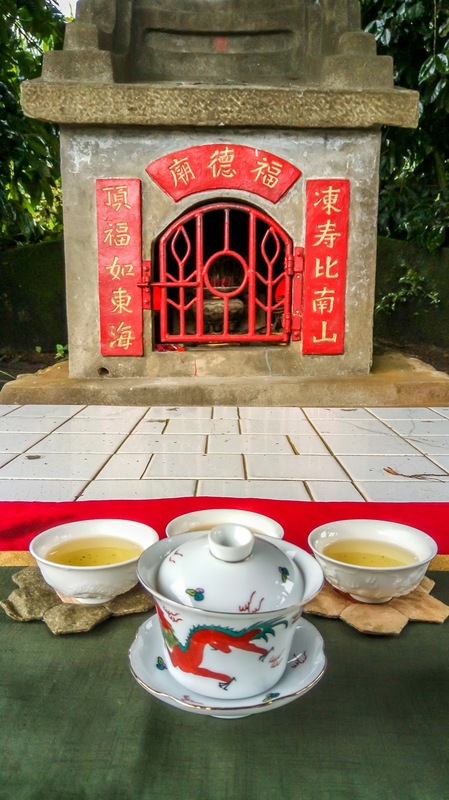 And I was even more happy (and lucky), because the farmer had a brew of this tea going on and I could taste it, brewed quite strong. (See my cup on the left). I learned that this tea comes from ShanLinXi. Its aftertaste is amazing with freshness and length. 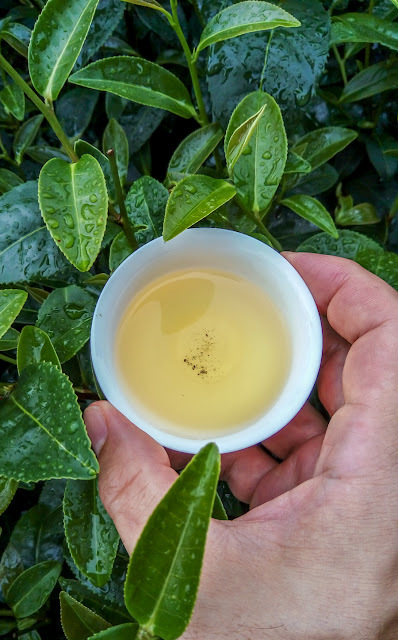 First they let you smell the spent leaves in the covered cup and than you could take a sip by pouring some tea from the big white cup in a small cup using the steel spoon. 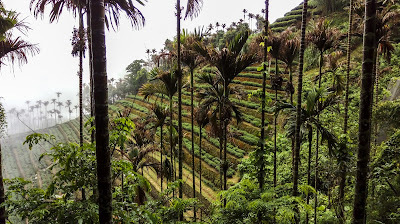 These teas had a certain homogeneity, but you could still smell that the roast in the No 2 was stronger than for the winner, for instance. They were all excellent, of course, but only getting a few drops of each was making it difficult to appreciate them fully. 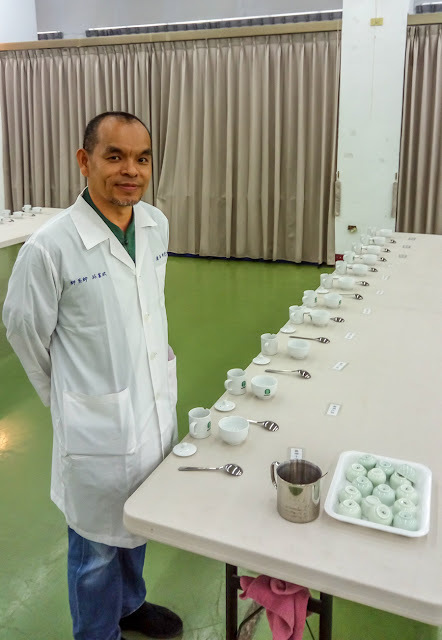 I was the last in my group to taste these teas and I was talking with the judge when I noticed that an assistant was starting to throw away the leaves to make space for a new brewing for the next group of tasters. I said: 'STOP, don't throw away these leaves. They have only been brewed once and they still have potential. Please give the the best 4 to me.' (I said in Chinese). They agreed and put them in the plastic foils they had used for the dry leaves! I had hit the jackpot! 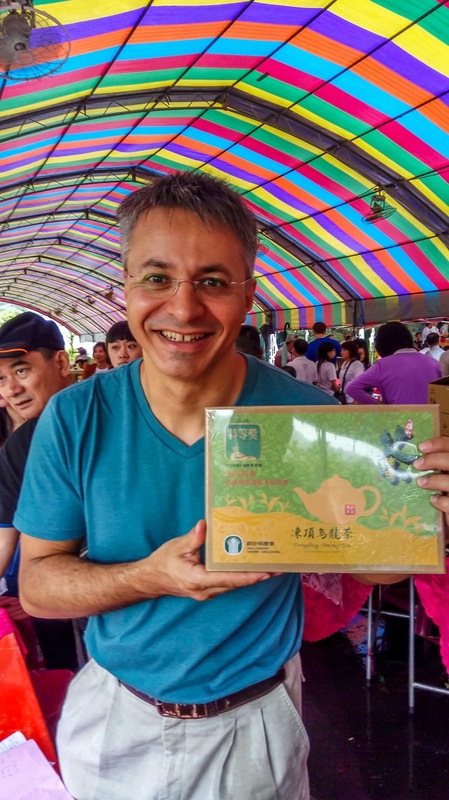 I felt like the richest man in Taiwan, having the 4 best Dong Ding Oolongs of this spring in my bag! Now, I had to find a place where to brew them. So I drove from Lugu to Dong Ding mountain and stopped at this spot amidst tea plantations. This little table in front of an altar had a roof protecting me from the rain. 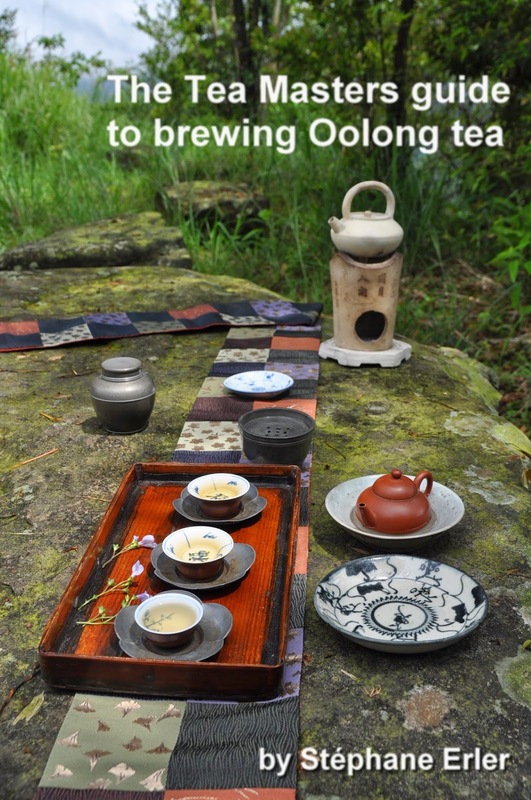 And that's where I enjoyed several brews of 3 of these teas. It's a good thing I had planned to make some tea outdoors. 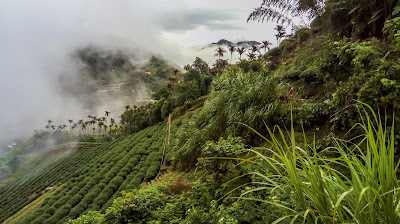 Enjoying Dong Ding style Oolong on Dong Ding mountain, just next to a tea plantation, during a rainy day is an experience I'm not going to forget! The roast of the leaves felt good in this humid (and almost cool) weather. I finished with the best. And I agree with the judges that it was superior. Its fresh, sweet, lingering and pure aftertaste is really impressive. It's an energy in your chest that goes up to the throat. A soothing effect. And 3 grams are sufficient to obtain this result! Amazing tea. My Chabu matches its environment perfectly and creates a deeper connection with this experience. 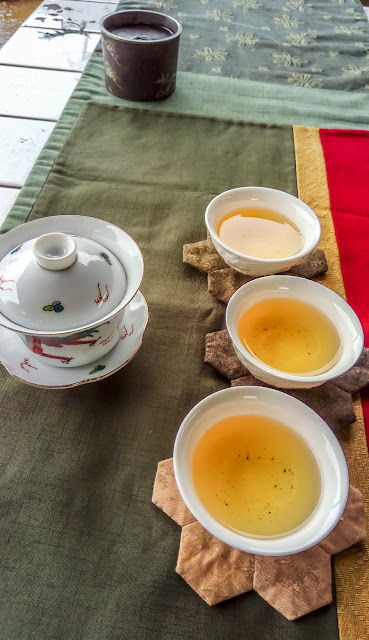 Green for the color of the tea leaves, red for the color of happiness and gold for the color of the brew or the ink with which this tasting is printed in my memory! 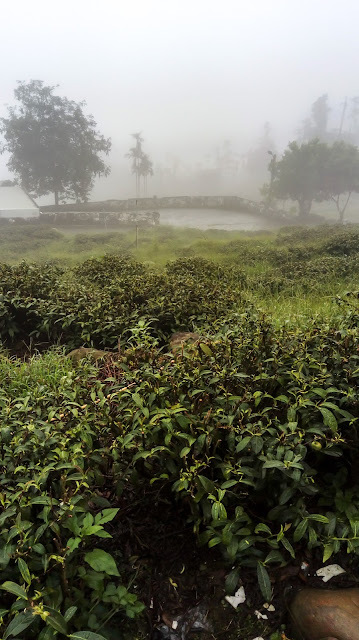 With rain came also clouds and fog. This fog is what makes spring Oolong leaves keep their freshness and light aromas as they grow. This fog contributed to Dong Ding's fame and it's the same fog we find nowadays in higher altitudes. Happy your determination and style gave you this enriching experience. Must have been an extraordinary experience! Would you say the exorbitant price is justified for the winning tea? Put differently is it that much better, proportionally, compared to other high quality Dong Ding? My guess is the price is mainly as high due to the winner-tag and the scarcity, or are there other reasons? The tea was excellent. Of course, its price wasn't proportionally better than other Dong Dings. You'll find better value with cheaper, lower graded Dong Dings. The price is supply and demand. It's all about scarcity and the reputation of this competition, the number 1 in Taiwan. Thanks for clearing that up, confirms what I was suspecting. 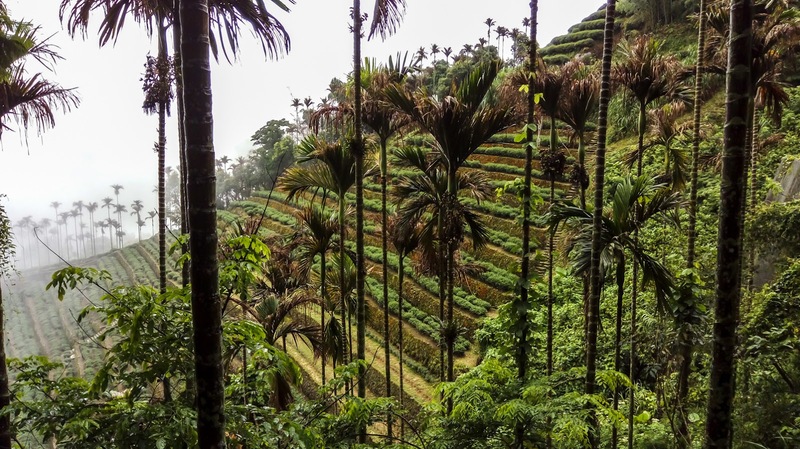 Guess it is a good thing for the farmers and tea industry in general. Yes, this type of event has lots of positive impact. When it's announced, it's free media for the industry. It drives farmers to compete on quality rather than on price. It helps establish a market price for good quality Oolong. And it makes a few farmers wealthy every year!